Country Music Goodness: What kind of music do you like? 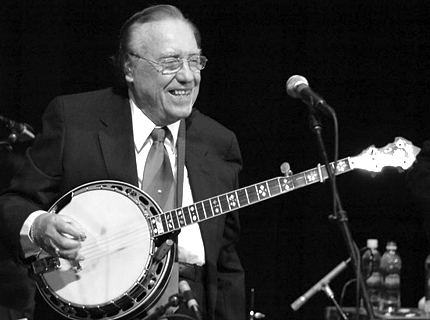 Earl Scruggs: My real soul satisfying music would be bluegrass but I like any good country music, country I’m talking about. I like the other kind but I don’t understand it quite as well. CMG: Do you love rap? CMG: Who are some of the other banjo pickers you admire? ES: All of them just about, there are so many good ones. What I have noticed, and I guess we are all inclined to be this way is, we are all better on some tunes than others, but they all show you some good pickin’. CMG: Did you take any banjo lessons? ES: Did you take any music lessons? CMG: I’m sure there are many stories you could probably remember about you and Lester playing with Bill Monroe, are there any that stick out in your mind? ES: I enjoyed the run with Monroe; see that was the first professional job I ever had with professionals, especially good singers. I thought Lester and Bill had a terrific duet. So I really enjoyed working with Bill and it was all good, the only trouble was the two lane highways back then. He had a ’41 Chevrolet car; he cut in two extra seats. Bill was bad to run late, if he said he would be there at 8, figure on ‘bout 11 or 12, then he’d say “get your foot in the gas pedal,” if you were driving, you know, and trying to make it. But you know it was a good run, good singing, and Mac on fiddle, and Sedric Rainwater on the bass, so it was a real thrill to work with that group. CMG: Did you have any idea at that time what was being created in that band? Because that is the band that all of us look at being the creators as a whole new musical style that we love today, and of course, you were such an important part of that. But did it ever occur to you at that time that anything like that might be developing? ES: No I had no idea; I knew it sounded good to me. I had heard Bill, of course, before he had Stringbean with him playing banjo. And that’s all the picking I had heard, only banjo picker I had heard when they called me to come work with Bill. I wondered how my style might go in the Opry because nobody else was playing it back then. But also Judge George D. Hay, the song “Old Judge,” that created the “Grand Ole Opry.” He was really a folk type, he loved folk music but he liked my pickin’ and accepted that I didn’t play the old style like the Possum Hunters and some of them people were playing. So it turned out real well. CMG: I heard that you were a really good baseball player and that’s actually was how you got hired with Bill Monroe and you learned the banjo afterwards, is that true? ES: Bill wasn’t playing baseball when I was with him, he did carry a mitt and glove and I used to catch him. He would really hurl a baseball in. The first time I caught a curve, that thing would really come in. I enjoyed that like when we had ridden 18 to 20 hours in a ’41 Chevy then we would get to a place and he would get that mitt, and glove, and baseball so it would give you a chance to work the kinks out of your knees. Hey there…nice site ya got here. Anyone else in the neighborhood? Thanks for the interview. What a humble man Mr Scruggs is. George Hay was known as the “Solemn Old Judge”, I think that’s probably what Earl said rather than “song”. Not sure what he meant about “Mac” on fiddle; Chubby Wise is the best known fiddler from that era. yeah, i had a hell of a time deciphering what he was saying much of the time, thanks for the clarification. what do you mean by “anyone else in the neighborhood”? Great to see a few scraps from Mr. Earl about Monroe and baseball. I wrote an article several years ago for Bluegrass Unlimited about Bill’s PRO team he carried in 1950, called “The Blue Grass Boys of Summer”. Baseball would sell tickets in those days, and Monroe was SERIOUS about his baseball team – they were GOOD! Monroe and the band used to play a mini-concert at home plate with no sound system during the “game” part. It was Stringbean who was hired as much for his baseball ability as for banjo picking and comedy. He was the Manager of Bill’s team during the War years, before Earl. Earl was “junior man” in the band when he was there, wanna bet EVERY junior man in the band had to “catch” Monroe for many years after? Great article and post, thank you. Regarding Earl’s favorite music to listen to, years ago (in the 1960s) it used to be said or even reported (hard to remember) that Earl REALLY liked Pete Fountain, the clarinet player. Anyone else ever heard that? That factoid has stuck in my head for 40+ years!